What is the Overflowing Scourge of the False Covenant? Pastor Tom Hughes asks Bill Salus why does Israel become a signatory to the infamous false covenant of Daniel 9:27? 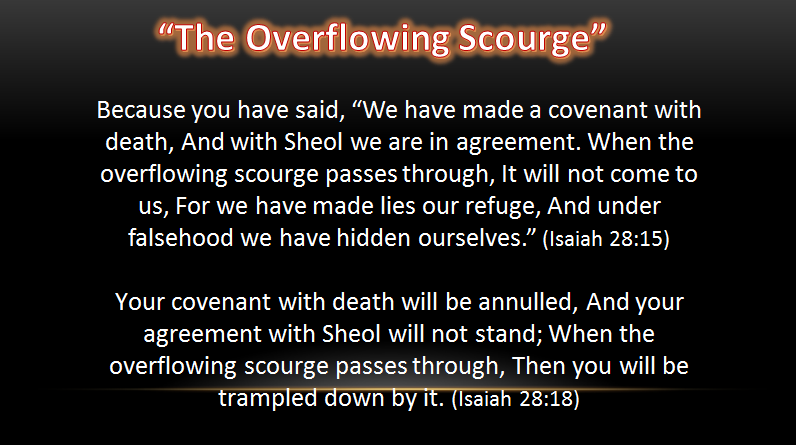 Bill explains that according to the prophet Isaiah, that Israel is attempting to avoid the “overflowing scourge” that is sweeping across the earth. In this edition of End Times TV, Tom and Bill address this topic along with the subjects of the Pre-Tribulation Rapture, the second chance for salvation after the Rapture, the mysterious connection behind Ireland, Israel and the Psalm 83 archaeological discovery in Irish bog soil in 2006. These are just a few of the topics covered in this program. Watch the program below.